All supercharged 2014-’19 C7 Corvettes, whether they’re a Z06 from the factory, or they have an aftermarket supercharger installed, all develop heat-soak problems after the car is run hard for a while. Heat-soak results in a significant power loss because the single heat exchanger supplied by the factory on a Z06 C7, or the aftermarket heat exchanger that’s supplied by the supercharger manufacturer, can’t reduce the supercharger coolant temperature quickly enough. 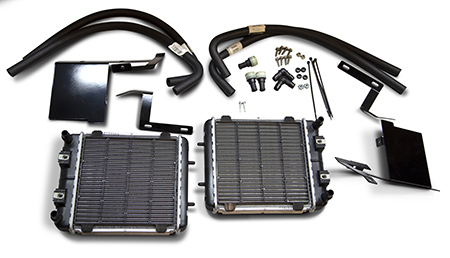 One of the best solutions is to install our Auxiliary Heat Exchanger Kit that includes two new heat exchangers that are installed, in addition to the existing single heat exchanger. The combined cooling effect of adding two new heat exchangers significantly reduces the power losses caused by heat-soak. Copyright Hamburger's Superchargers Inc.. All Rights Reserved. by 3DCart eCommerce Host.